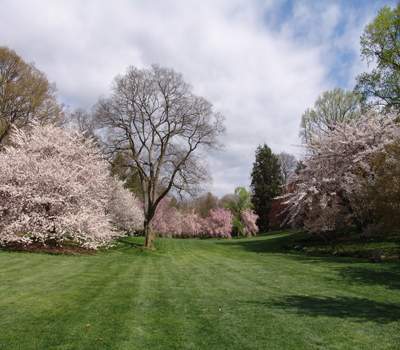 The wave of warmer weather, the exploding cherries and magnolias, and the smell of the breeze are all welcome signs of spring. This time of year also makes me think of chocolate. With Easter around the corner and those brightly colored Cadbury Eggs and Peeps showing up in stores, the season for sweets is upon us! 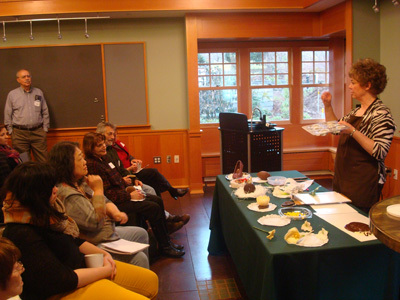 At the end of February, Nancy Stiebitz, owner of Encore Chocolates in Rochester, New York gave a two-hour chocolate workshop at the Scott Arboretum. 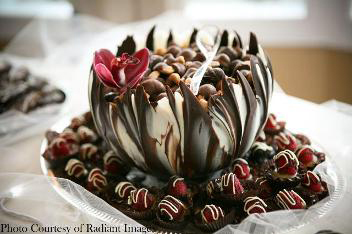 Nancy has been making and selling chocolates for 25 years and in the past several years has been giving workshops and demonstrations around Rochester. At the Arboretum’s class, “Cultivating a Taste for Chocolate,” she shared a range of information about this edible and affordable luxury. As Nancy’s daughter, I grew up surrounded by delicious smells and an abundance of gourmet sweets. However, I never really knew much about the horticultural side of chocolate. For a dessert that has such universal appeal and a ubiquitous presence in our lives, it’s amazing to me how the cacao tree grows, how the pods develop, and how the process turns a bitter seed into a delicious and arguably addictive treat. Belonging to the Sterculiaceae family, the theobroma cacao tree has three main varieties that produce fruit to be processed into chocolate. The Criollo variety is originally from Central America. This type of cacao tree is low yielding, but produces very high quality chocolate that is rare and expensive. The majority of chocolate that we consume comes from the Forastero variety. In fact, 80-90 percent of chocolate that we consume comes from this cultivar. It is grown mostly in Africa, but also in Central and South America. 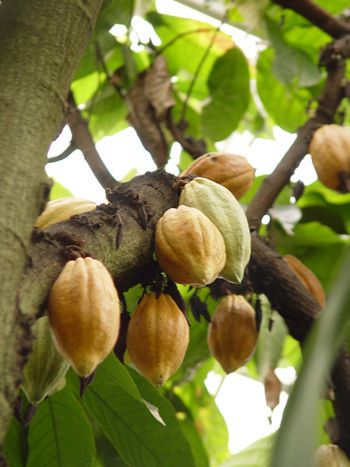 The third type of cacao tree is Trinitario, a crossbreed between the Forastero and Criollo. This variety is mainly cultivated in Central and South America and Asia. It has the aroma of Criollo and the disease resistance and productivity of Forastero. The flavor of the cacao beans is not only dependent on the variety, but also on environmental factors: soil, temperature, sunshine, and rainfall. The cacao tree requires very particular conditions. For example, it only grows in regions that are near the equator: a band of 10 degrees north and 10 degrees south of the equator, to be exact. Also, it grows best in the shady understory of dense rainforest, where temperatures don’t drop below 65 degrees Fahrenheit and where there are 80 inches or more of rainfall each year. Even in these ideal conditions, the cacao tree is prone to disease. Three main types of fungal disease impact the cacao tree: frost pod rot, witches broom, and black pod rot. In a recent year, 80% of the cacao tree crop in West Africa was lost due to black pod rot. West Africa is the number one producer of cocoa beans, so this crop damage translated to several hundred million dollars in lost revenue. In the wild some trees may reach 40 feet in height, but on plantations, they are pruned to 20 feet or shorter to simplify harvesting. A young tree can produce pods as young as two years old, but most do not fruit until they are six years old. 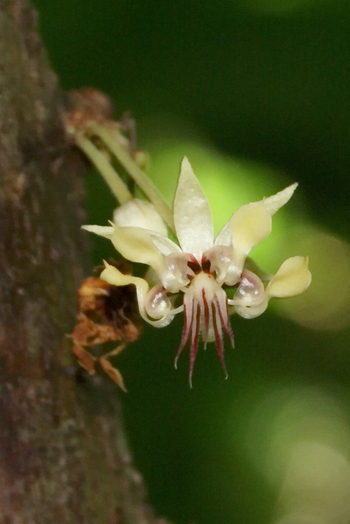 Another interesting fact about the cacao tree is that the flowers grow directly out of the trunk. The blossoms are the size of a nickel, and the tree produces blossoms year around. The flower has a very intricate structure, and in fact is pollinated by only one type of insect: the midge. This tiny fly is smaller than the head of a pin. Even though the cacao tree produces hundreds of flowers each year, only about one to three percent of flowers pollinated and develops into pods. Not surprisingly, this tiny insect does not like plantations – it thrives in the rainforest environment where there are rich layers of forest litter and more dynamic ecosystems than on plantations. 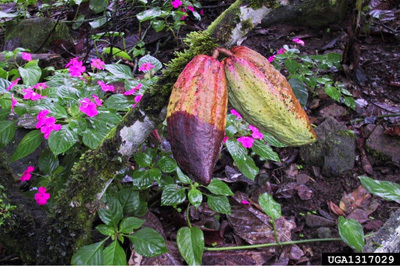 Once the cacao flower has been pollinated, the pods develop, usually reaching 6 to 12 inches. 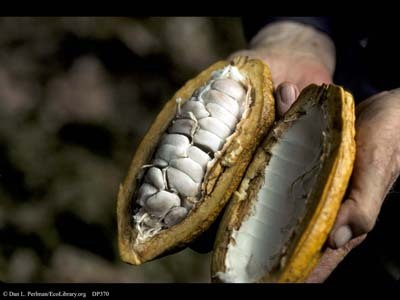 Each cacao tree produces about 30-40 pods. Within each pod, there are approximately 40 beans. Interestingly, the pods never fall from the tree naturally: animals chew them off so that they can get to the sweet pulp inside the pod, or humans harvest them for processing. On plantations, there are usually about two harvests a year. Stay tuned for Part II: an overview of the process that makes the fruit from this tropical tree into a delicious treat that can be found in grocery stores, specialty shops and in Easter baskets. Very interesting article. I never knew what a cacao pod looked like — and certainly not what a cacao pod’s insides look like. One of the most informative and fun museums that I have ever been to is the chocolate museum in Barcelona. It really is amazing what a history this plant has with humans, and the things that can be done with it.